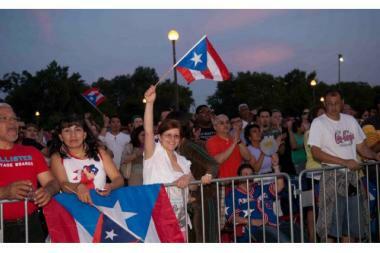 Revelers at a recent Puerto Rican Festival. HUMBOLDT PARK — Humboldt Park residents, stop calling the Chicago liquor commissioner. Commissioner Gregory Steadman, flooded with calls, said Thursday that not only has he not denied a liquor license for the Puerto Rican Festival, happening from June 13-16 in Humboldt Park, he hasn't even gotten an application yet. Yes, festival organizers have proposed a beer garden for the first time this year, but somehow word got around that the license had already been denied and caused a general uproar among residents, pitting various neighborhood groups against each other with some crying racism. Some even posted Steadman's office number online so residents could call and complain. "In an unprecedented act and responding to racist pressures liquor commissioner Gregory Steadman made a decision to deny the Puerto Rican Parade's right for a beer garden license for its festival," read a segment from a Puerto Rican Cultural Center email newsletter sent out late Wednesday night. "This constitutes a slap in the face to our community and points to a serious racist practice." Steadman insisted, however, that he had simply laid out his requirements to grant the license, including beefing up security and making sure police approved. It is typical for organizers not to actually apply until the final weeks before the event, he added. "There have been claims of racism, but I'm not getting into all that," he said. "All I'm doing is waiting to see the application, looking to see a security plan, and looking to see a response from the police department — and of course I'm listening to the comments of community as well." He said any extra scrutiny to given to the Puerto Rican Festival for a liquor license is only due to the fact that it has never had one before. In fact, no festival in Humboldt Park had ever been granted a liquor license until last year's Riot Fest, run by non-Hispanic white men, leading to the claims of a double standard. "It is discriminatory not to allowed the Puerto Ricans Fest to have one simple beer garden but yet is alright to allowed Riot Fest to have five beer dispensers," said one Facebook commenter. "Wake up Boricua, the plans of the City of Chicago is to eliminate the Puerto Rican Fest and replace it with Riot Fest." An online petition was even started an online petition to deny Riot Fest a license because of perceived discrimination against the Puerto Rican Festival. A woman who answered the Puerto Rican Parade Committee's phone Friday morning said they could not comment on the matter for "legal reasons." Festival organizer Hank Zamola of Special Events Management, the company that has taken over festival planning, said he, too, has tried to stay out of the fray. "Sometimes people say one part of the community is discriminating against another part of the community," he said. "I don't buy into that. I think mostly all the people are really good people who just have different views." Plans for the beer garden are tight, he said, and include 8-foot fencing around the triangular beer garden near the boat house. People will not be able to take beer out of the garden and its presence will tripling security from the 12 security guards the fest had last year, to 36 to 45 this year, according to Zamola. He said the Puerto Rican Parade Committee is pinched financially — as a lawsuit filed last fall details — and desperately needs the money beer sales would bring in. "In the past they've done what everybody else wants, not necessarily what's good for them fiscally," he said. This year the festival goers will also be asked to give a "soft donation" though it won't be required. Beyond that he said having beer inside the festival will have other benefits. "People come to events generally and they want to find a glass of beer and wine and there's an expectation of that," he said. "A lot of time people buy their own and bring it in a brown bag." The whole festival will be totally fenced in again, but this year will only have one entrance so security can more easily stop people from sneaking in alcohol and also keep out those who are already drunk. Humboldt Park Advisory Council President Amy Vega agreed that having beer inside the festival may actually improve the the alcohol situation surrounding the fest, which often also includes people drinking out of their cars parked nearby. "Getting the liquor license is something that can empower [festival organizers] and work as a tool to really, really regulate the way the liquor consumption is happening," she said. Vega, who formerly worked as executive director of the Puerto Rican Parade Committee herself, said she tries to stay neutral now that she's HPAC president, though she does think the festival should be able to have a beer garden if they want one. "I think the plan that they [the organizers] have in place is very feasible," she said. Having a beer garden has been talked about in the past, but she does not think organizers ever actually applied for a liquor license before. Even though last year's festival was reportedly much better than previous years in terms of crime, nearby resident Andy Rodriguez is still skeptical, feeling that crimes that happen in the neighborhoods during the festival don't always get linked to the event itself. He and others in his neighborhood group, the East Humboldt Park Neighborhood Association are among those that oppose the beer garden. "Because there hasn't been a safe year in the fest, we don't think a beer garden would be appropriate," he said. "If this fest goes a few years without violence, and police do patrols and keep it safe, we wouldn't be opposed to it." Who Are The Faces On Crown Fountain?